1835: JS Staedtler starts up his eponymous company. Begun within the old city walls of Nuremberg, Germany, the family had been making pencils even before the company startup date. The first mention of the Staedtler name was listed in 1662 and even then, they were pencil-making craftsmen. On this day, Staedtler got permission from the municipal council to produce blacklead, red chalk, and pastel pencils in his industrial plant. By 1866, they employed 54 people who produced 15,000 gross or 2,160,000 pencils per year. The privately owned company has worldwide distribution of a large variety of writing utensils as well as other stationery items. Between 1900 and 1901 they launched their Mars and Noris brands, the latter being very popular in British schools. In 1922, a subsidiary was established in New York and in 1926 one was established in Japan. In 1937, they changed their name to Mars Pencil and Fountain Pen Factory and expanded their product line to include mechanical writing instruments. In 1949, Staedtler began to produce ballpoint pens as fountain pens were going out of style, however they continue to produce high end fountain pens even today. In 1950 they introduced mechanical pencils and theirs were made with a casing of wood. They have changed logos for their company eight times since 1908. Today’s logo along with a name in all caps: STAEDTLER, has been used since 2001. Their official name is Staedtler Mars GmbH & Cl. KG and they produce not just pens and pencils of an astounding variety but are also in charge of the FIMO brand of modeling clay. They have won a variety of awards for their innovative and ground breaking work in pencil design. Axel Marx leads the company that now has six production plants, three of them in Nuremberg. They have 23 sales subsidiaries and have business partners in 150 countries. They are the largest European manufacturers of wood cased pencils, OHP pens, mechanical pencil lead, erasers, and modeling clay. Although our modern idea of a pencil stems directly from an artist’s brush, something used to scratch symbols onto papyrus or wax tablets has been in used since Roman times. The meaning of a graphite writing implement came into use in the late 1500s after a large deposit of graphite was discovered in northern England. They held a monopoly on graphite and so the making of pencils until a method of reconstituting graphite powder was found. Wood holders for the graphite stick soon followed and erasers were attached in 1858. Colored pencils are made of wax or oil based cores tinted to various shades with some being water soluble. Pencils can today be made of graphite/clay mixture, charcoal, or carbon. The core can be encased in a variety of ways, as well. There are even pencils made from recycled newspapers on the market. April 2, 1827: Joseph Dixon produced the first lead pencils. The word “pencil” comes from the Old French pincel or a small paintbrush which comes from the Latin penicillus for little tail. Sometime in the first half of the 16th century, a huge deposit of very pure graphite was discovered in Cumbria, England. The substance was first used to mark sheep but was eventually cut into manageable sticks and used to mark other things, like paper. The substance was thought to be a form of lead and called plumbago, Latin for lead ore. This is why, even today, we call the stuff in our pencils lead instead of the real substance, graphite. Wood holders for the graphite sticks were invented in Italy around 1560, but they used solid graphite as well. There were improvements made on the system of encasing the graphite inside the wood but the commodity was still considered luxurious enough to be problematic during the Napoleonic Wars, since France could not get the pure graphite from England. In 1795, it was found that mixing graphite powder with clay produced a product that still acted like a writing instrument. The ratio of graphite to clay also gave control over the hardness of the graphite rod. Dixon, using graphite found in mines in Sturbridge, Massachusetts found a way to mass-produce pencils and by 1870 The Joseph Dixon Crucible Company was the world’s largest producer of pencils. 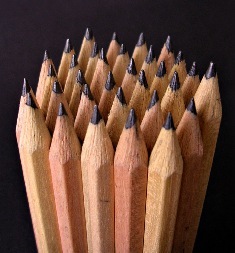 By the end of the 1800s over 240,000 pencils were used each day in the US. At the time, the wood of choice to encase the lead, was Red Cedar. It was both nice smelling and didn’t splinter when sharpened. By the early 1900s the supply of Red Cedar had dried up and recycled cedar fences and barns were used. Pencils were so important that during World War I the use of rotary pencil sharpeners was outlawed in Britain because they wasted too much graphite and wood, both scarce commodities. Sharpening pencils had to be done with a knife. Erasers were finally added in 1858 in acknowledgement of the fallibility of writers. Ever more efficient ways of mass producing pencils came along and the prices dropped. Dixon Ticonderoga Company is now a producer of office and art supplies with one of their most well-known brands being Ticonderoga, the familiar yellow No. 2 pencil with the green and yellow ferrule – the band that holds the eraser onto the pencil. They also make Prang school and art supplies as well as own the Lyra brand of art products. Mechanical pencils were developed in the late 1800s but only became successful with Japanese improvements in 1915. At the same time, American Charles Keeran was also improving the product and the two ideas were combined to make the pencils we have available to us today. Also on this day: Giacomo Casanova – In 1725, Casanova was born. US Coinage Act – In 1792, the Coinage Act was passed. The Sunshine State – In 1513, Juan Ponce de León discovered Florida. Starving – In 1863, the Richmond riot took place. March 30, 1858: US Patent number 19,783 is granted to Hyman L. Lipman of Philadelphia, Pennsylvania for a pencil with an eraser attached. According to the patent, the pencil was made in the usual manner, except that one quarter of length was reserved for holding a piece of prepared India-rubber. This allowed the eraser to stay with the pencil for ease of use. Pencils contain not only those handy erasers but the writing material as well. We commonly refer to the substance as lead, but it is in fact, graphite and has been since 1564 when a large graphite source was discovered in Borrowdale, England. Before graphite, the pencil wasn’t anything more than a piece of lead. With the introduction of this darker substance, a casing was needed to keep the graphite from breaking. First the graphite was wrapped in string and finally it made its way inside a wooden casing. They were finally mass produced in Nuremberg, Germany starting in 1662. They were not painted because it was felt that the high quality wood casings were an advantage. The best source of graphite was found in China. The color yellow is a sign of royalty and respect in that country. In order to advertise that one’s pencils contained Chinese or superior graphite, manufacturers started painting them yellow. Pencils are classified in various ways. The hardness, the blackness, and the fineness of the lead are indicated by letters or numbers, depending on where it is made. There are various types of pencils based on their marking materials (graphite, charcoal, carbon, colored, grease, and watercolor). Pencils are classified by their use (carpenter’s, copying, erasable color, non-reproducing, stenographer’s, and golf pencils). There are four different shapes (triangle, hexagon, round, and bendable). And there is a whole different class by manufacturer, especially based on mechanical pencils. Also on this day, in 1867 America bought Alaska.